Within the ENPI FLEG Program there is an overall Program Management Team (PMT) consisting of one member from each of the three Implementing Organizations (IOs). The PMT is responsible for the overall planning, guidance, and implementation of the Program. 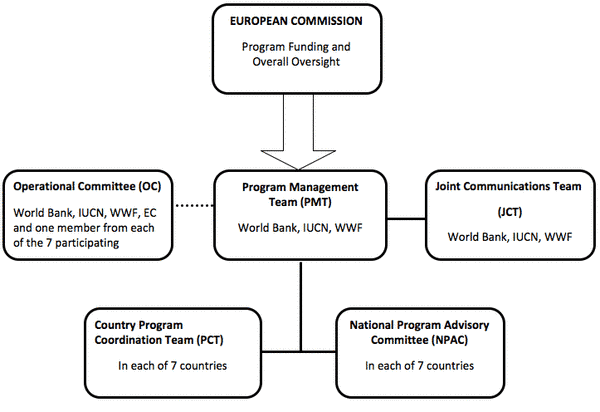 The Operational Committee (OC) includes a representative from each Participating Country, the World Bank (WB), IUCN, WWF, and the European Commission. The OC meets at least annually to discuss the Program's progress and review plans and it is responsible for providing advice on policy and strategic directions of the Program. The World Bank chairs the OC and decisions are taken by consensus. A Joint Communications Team (JCT) was established, consisting of one member from each of the three IOs to provide guidance on communications for the Program as a whole. In each country a communications coordinator (CCC) is appointed to liaise with the JCT and to ensure that all the countries communications products meet the program visibility and branding requirements. At the country level each country has a Country Program Coordination Team (PCT) which is made up of one member from each of the three IOs. Also each country has a National Program Advisory Committee (NPAC) which provides guidance to the PCT. The NPACs generally consist of eight members (1 ENA FLEG National Focal Point, 2 representatives from key government institutions, 3 representatives from key NGOs, 1 representative from the European Commission and 1 representative of the country PCT). The NPAC’s role is to provide guidance to the IO’s on the development, planning, implementation, monitoring and evaluation of the Program activities at the national and sub-national levels in each participating country.